Orange County Mayor Teresa Jacobs’ Youth Mental Health Commission Implementation Team met on Monday to begin the work of accomplishing the goals set by the Youth Mental Health Commission. The Youth Mental Health Commission, founded in August 2013, was a 20-member group comprised of elected officials, law enforcement and community leaders. 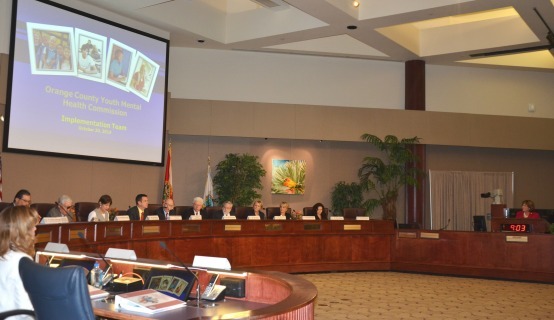 The Commission was focused on developing new strategies and initiatives to address children’s mental health in Orange County. According to the National Alliance on Mental Illness, four million children and adolescents nationwide suffer from a serious mental disorder. In Orange County, there were more than 2,000 psychiatric hospitalizations of children up to age 17 in 2013, which contributed to 54 documented suicides of young people from 2011 to 2013. A collection of photos from the Youth Mental Health Commission Implementation Team meeting are available on Flickr for use by the media.